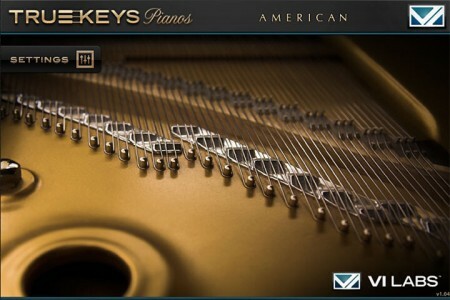 True Keys American is part of the highly acclaimed True Keys suite of virtual concert grands. 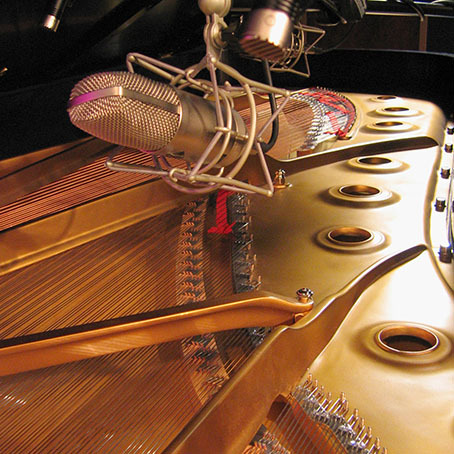 With nearly 14,000 audio files recorded with multiple high end mics and preamps, the timeless sound of this piano is available at your fingertips. 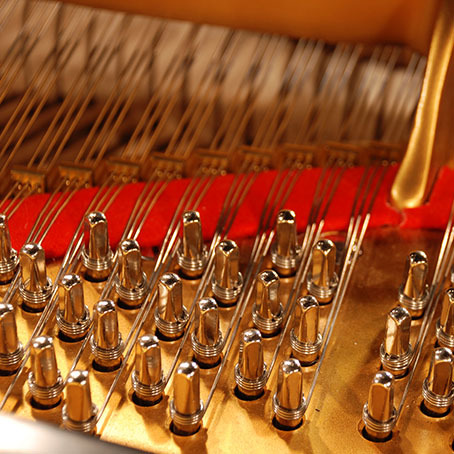 Advanced scripting and specialized sampling replicate the fine mechanical details of the acoustic piano down to the resonances and noises of each key. The American grand is entire sample-based. An easy to use interface offers full control of all aspects of the piano such as release trails and pedal noise. Three individual mics plus a custom mix along with several more controls offer tremendous flexibility in getting the perfect sound. 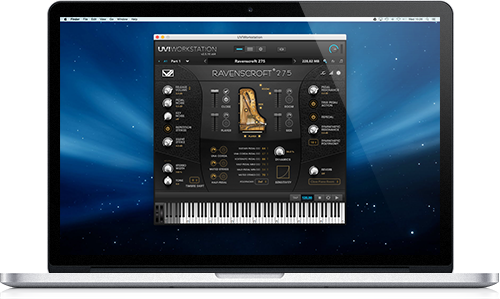 Fast loading times and minimal resource usage made possible with the UVI Workstation sample player all make for a powerful but easy to use virtual piano. True Keys American delivers the majestic sound of the Steinway D© nine foot concert grand. With powerful bass, robust attack and deep sustaining overtones, this versatile instrument can rise above a full orchestra or stand out in a busy mix. It also has a dark delicate side, mellow and rich, especially when played with the stereo ribbon Side mic. Everything was deeply sampled including the Una Corda soft pedal and all sympathetic resonances. The sampling was done in a medium-size studio with minimal ambience and left us with excellent detailed recordings. This grand has a classic sound and is a staple of stages and studios worldwide. 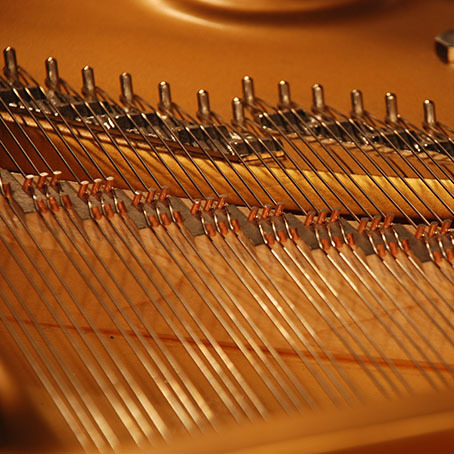 Sympathetic resonances of real pianos add complex dimensions to the sustain. The richness and extra harmonics of all the strings sing together. Unlike other libraries and digital pianos, True Keys uses discreet samples plus complex scripting for both sympathetic and pedal-down resonance. This truly realistic resonance simulation is fully adjustable in volume and polyphony giving a high level of control. Deep rich resonances made possible only with real samples. 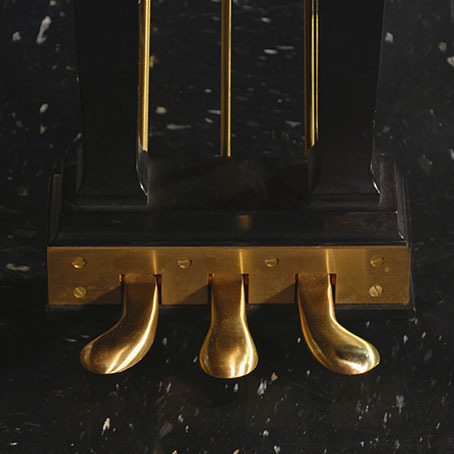 All three grand piano pedals are available in True Keys and can be mapped to any MIDI controller of your choice. The pedal-down resonance is tied to the sustain pedal and responds physically like the real grand. Repedal allows more blending control as notes continue to sustain during quick pedal actions. Half-pedal works with your continuous sustain pedal using real samples and is customizable to your pedal. Sostenuto is supported and works with sympathetic resonance. Full grand piano pedal control and adjustability. 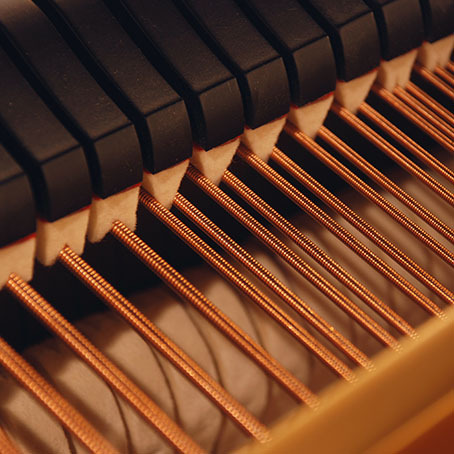 The strings of a piano don’t immediately stop singing when a played key is released as the damper has to absorb the energy. This characteristic ‘ring’ left over gives the piano extra resonance and body. Release trail samples are carefully voiced for each key and respond based on both velocity and time. Just as playing a key, what happens when a key is released is also an important component of a real piano. Thousands of detailed release samples including true staccato trails. 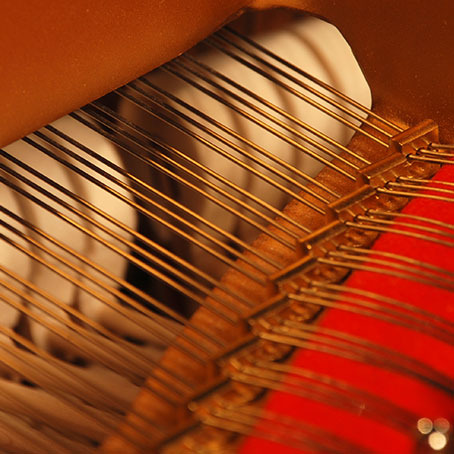 The una corda or soft pedal on a grand piano changes the tone in two ways. Hammers hitting three strings shift slightly so they only hit two strings which results in less volume. Plus a softer part of the hammer hits the strings creating a warmer tone. This unique tone is captured fully with discreet samples and provide another way to alter the volume and voicing. This completes the full pedal setup of the real grand. Discreet soft pedal sustain and release samples add to the tonal palette. Everything is sample-based down to the adjustable key noise and damper pedal samples. The Repetition strike feature varies the tone when repeating the same key with the pedal down. Go brighter or darker with the Tone control, and select from 22 superb IR convolution reverbs representing all sizes of rooms. MIDI and volume response are fully adjustable to fit your playing style and controller. Custom key and master tuning controls with presets are also included. All three pianos sound and respond great ‘out of the box’ with the most natural sound possible. 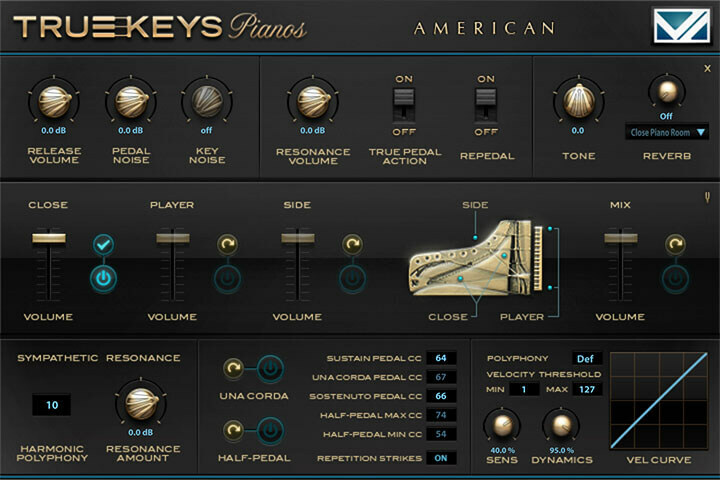 True Keys was designed to offer the best playing experience with the least amount of effort. MIDI and volume response, custom tuning controls, key noise samples, pedal noise of dampers responds to pedal speed, repetition strikes, tone control, polyphony settings and 22 superb convolution IR reverbs. Sampled key and pedal noise plus MIDI response and IR reverbs. 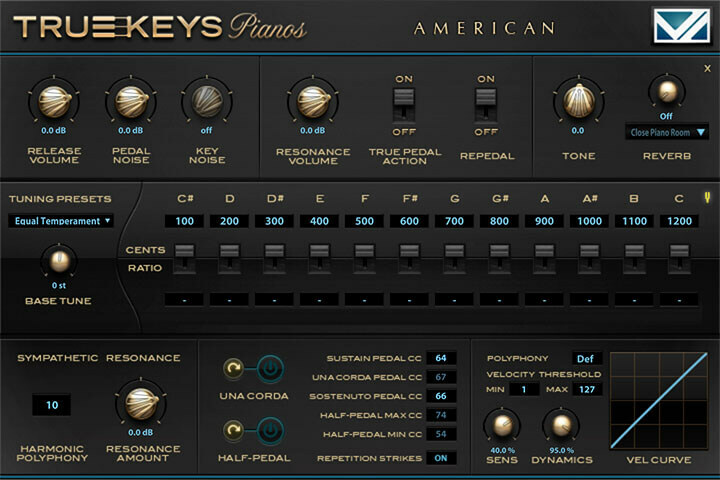 True Keys : American Grand comes with its own sample player, the UVI Workstation 3 (requires v3.0.0 or later). True Keys : American Grand is also compatible with UVI's Falcon. Computer-based copy protection. Use on up to 3 machines at once, no dongle required! For complete step-by-step instructions and video on how to download and install the True keys Pianos library and UVI Workstation, please visit our website at vilabsaudio.com/support. This is to ensure you get the most accurate and latest install instructions as we and UVI release product updates or any other changes occur.